McDonald’s Canada popular Free Coffee promotion is back! Enjoy a FREE small cup of McCafé Premium Roast brewed coffee at McDonald’s from February 27th to March 5, 2017! There’s absolutely no charge and is available any-time of the day. The freebie is available at all participating McDonald’s restaurants in Canada. There’s a limit of one per customer, per visit. You can also upgrade to a medium for an $0.75 plus tax or a large for $1 plus tax. Enjoy a small cup of our McCafé Premium Roast Coffee, on us! Each cup is brewed from 100% Arabica beans – widely recognised for its smoother taste and enticing aroma. And best of all it’s free! Not valid with any other McCafé beverage. Extra Value Meal or Value Picks offer. Limit one per customer, per visit. At participating McDonald’s restaurants in Canada. REMINDER: AMEX Starwood Preferred Guest (SPG) Credit Card – 20,000 Welcome Points = 5 Free Nights Hotel! If you’re a regular follower of my blog, you’ve likely started Travel Hacking after reading my all-time most popular post: TRAVEL HACKING: American Express Gold Rewards Card – FREE 25,000 Points = FREE Flight to Anywhere in North America! Travel Hacking is the art of collecting miles and points to get free flights, hotels, and more. To get the 20,000 welcome Starpoints, all you have to do is sign-up for the card and charge $500 in purchases to the card within the first three months of card membership. The card has a $120 annual fee, but even with that, this is the absolute best card to have because of the generous welcome bonus (worth over $500). If you don’t like the card, you can cancel the card at any time without penalty and keep your points. Welcome Bonus: Earn 20,000 Welcome Bonus Starpoints, after you charge $500 in purchases to your Card in your first three months of card membership. That’s enough for up to 5 free nights. Because the card sells itself, I’ve been able to easily refer friends and family to also sign-up for the card and accumulate lots of bonus points (10K bonus points for each referral). 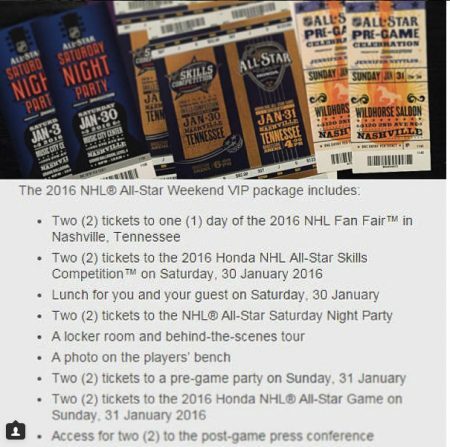 Earlier this year, I used a bunch of points to bid and win a SPG Moments auction and got to go to the NHL All-Star Game in Nashville! It was truly an once-in-a-lifetime experience and I was only able to go because of SPG. REMINDER: AMEX Gold Rewards Card – FREE 25,000 Points = FREE Flight to Anywhere in North America! If you haven’t started Travel Hacking yet, make this the year to start! You’ll be glad you did! It’ll change the way you travel forever. Travel Hacking is the art of collecting miles and points to get free flights, hotels, and more. If you already have the AMEX Gold Rewards Card, make sure you should read my other Travel Hacking post and get the AMEX SPG Card too – get up to 5 free nights hotel! The American Express Gold Rewards Card is currently the #1 Best and Most Flexible Travel Rewards Credit Card available today. For a limited time, sign-up for the American Express Gold Rewards Card and get a phenomenal 25,000 FREE Welcome Bonus Rewards Points! That’s enough points for a round-trip flight to almost anywhere in North America! American Express is also waiving the annual fee the first year ($150 value) which means there’s zero cost to you, making this an unbelievable freebie! All you have to do is charge $1,500 in purchases to your card within the first three months of card membership to get the 25,000 welcome bonus membership points. If you don’t like the card, you can cancel the card at any time without penalty and keep your points. Get 25,000 free Welcome Membership Rewards Points! That’s enough points for a round-trip flight to almost anywhere in North America (up to $550 value)! Or save up more points and travel to other destinations for free! See where else you can fly with Flight Reward Chart. The first year is absolutely free ($150 value), so if you decide the card is not for you, just cancel it and get keep the 25,000 free bonus points! You can cancel the card at any time without penalty and keep all your points. If you consider all the points, this is a deal you can’t ignore! Worst case, you take the 25,000 free points and cancel the card before the first year. Click here to get your FREE 25,000 Membership Bonus Points and start Travel Hacking now! TRAVEL HACKING: American Express Gold Rewards Card – FREE 25,000 Points = FREE Flight to Anywhere in North America! 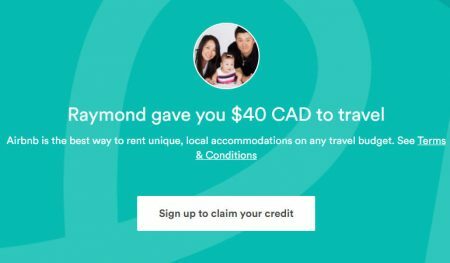 REMINDER: Airbnb.ca – Claim Your FREE $40 CAD Travel Credit! Post Update: I just booked something on Airbnb and their FREE $40 CAD travel credit promotion is still available! Sign-now to claim your credit. For a limited time, click on any of the links in this blog post when you sign-up for an Airbnb account and you’ll get a FREE $40 CAD travel credit towards your first booking! Sign-up now while the offer lasts. Click here to visit Airbnb.ca to get your free $40 travel credit or for more details about the website. Airbnb.ca: Claim Your FREE $40 CAD Travel Credit!